Ejected Mossad agent Ya-ara Stein is tapped by Israel’s prime minister to create a secret, un-acknowledgeable task force that can strike at will, without publicity, and without compunction. If it’s necessary to kill for Israel, this task force should be able to do exactly that. Stein is brilliant and deadly, a combination that probably should go with some form of psychopathy. Or is that a normal result of training with Mossad and appreciating the horrors that antiSemitism and global warfare commit against Israel daily? 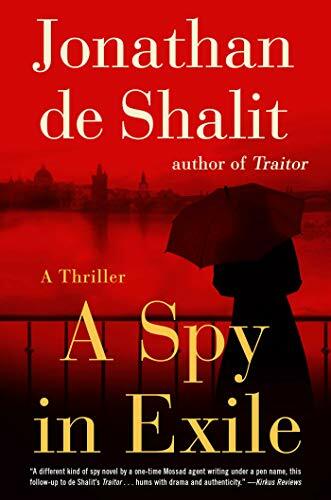 Because author Jonathan de Shalit (a pen name for a former Israeli intelligence agent) never clears that up, a terrible ambiguity lingers, and even deepens, around this highly connected woman. Her love affairs are riven by treachery that she’s willing and able to conceal. Her friendships shiver with regrets and past violent actions. She is, in fact, the title’s embodiment: A Spy in Exile. “Ya’ara hadn’t believed to begin with that the sloppy occupants of the farm could be running the show all on their own. “‘Do you know what these are?’ Ya’ara asked Aslan. Yet Ya’ara is labeling more than her team when she talks about “missing a part of their soul.” Her clarity of mission allows her to take finely honed extreme risks for herself, and to betray as needed, in order to complete the task. It’s not a comfortable situation to observe. De Shalit’s first book, Traitor, won acclaim and in particular was praised for the author having learned from John Le Carré. If that is indeed the case, then the author has learned to portray a female and still employable version of Le Carré’s less than lovable traitors. Oh, Ya’ara won’t betray Israel, that’s clear—but don’t expect her to regret any other option for more than a day or so. She’s not made for high principles other than doing her job. It’s stylish to portray Mossad as the least likeable and most dangerous of all the secret mission forces in the Western world. A question that lingers long after reading this fast-paced modern espionage novel is, Where’s the moral gap? In the agency—or the author—or just the character in place? Or, more likely, in exile.